For this post I wanted to create a poster for science fiction movie. I found this tutorial on YouTube so I decided to follow it. It is not the same as the original, but I dried my best. I am adding a link on YouTube so you can see for yourselves. Metropolis, German silent film, released in 1927, featuring director Fritz Lang’s vision of a grim futuristic society and containing some of the most impressive images in film history. The great future city of Metropolis in the film is inhabited by two distinct classes: the industrialists live off the fat of the land, supported by the workers who live under the city and endure a bare-bones existence of backbreaking work. The story concerns a forbidden love between Freder (played by Gustav Fröhlich), a young man from the industrialist class, and Maria (Brigitte Helm), an activist who preaches against the divide between the two classes. The subterfuge and deceit involving a robot duplicate of Maria culminate in a revolution that quickly spells disaster for all involved. 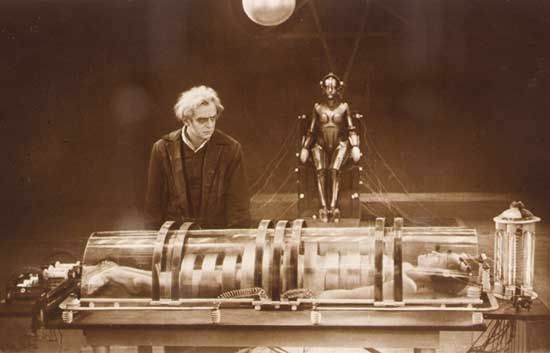 Metropolis was not a success in its initial German release. It was cut by about a quarter from its original length of 153 minutes for its American release and a German release. These shortened versions were further reedited many times over the decades, and various versions exist in different countries. For example, in 1984 an 87-minute print was released with a rock sound track constructed by composer Giorgio Moroder. The original 1927 release print seemed lost forever, but in 2008 a deteriorated but nearly complete print that ran 147 minutes was discovered in the archives of the Museum of Cinema in Buenos Aires, Argentina. After several months of restoration in Germany, the reconstructed Metropolis had its first showing at the Berlin International Film Festival in 2010.